To ensure fast visualization in all clients, cached point scene layers are used to display large amounts of point data in ArcGIS Pro and in a web scene. 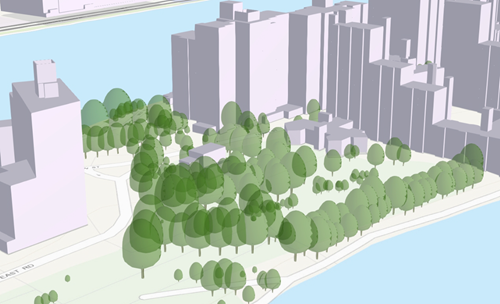 For example, you may use a point scene layer to display the trees in a city using preset layers. Point features in point scene layers can be symbolized with point symbols that are billboarded or contain 3D marker symbol layers.. Any feature that can be represented by a point can be used in a point scene layer. Point scene layers are automatically thinned to improve performance and visibility at greater distances. Automatic thinning means that not all features are displayed at greater distances. As you zoom in, additional features are displayed until you reach the highest level of detail, when all points will be shown. A point scene layer is only supported in the 3D category of a scene. You can view attribute information about a selected point feature in a scene with the Explore tool . The pop-up window displays a formatted list of attributes. You can snap to a point feature layer when snapping is enabled. To control the visualization and display of a point scene layers, select the layer in the Contents pane, and click the Appearance tab. Set the visibility range of the layer by adjusting the In Beyond and Out Beyond scales. Use Transparency to set a transparency percentage to see through the layer and reveal information below it, or drag Swipe to visualize a scene and reveal layers beneath. Modify the layer face culling and lighting options to see through the front or back of the points, depending on which side of the point scene layer you are viewing. Access the Symbology pane to modify the symbology of the point scene layers. To learn more about changing the appearance of a scene layer, see Change the appearance of a feature layer. To access the general and display properties of a point scene layer, right-click the point scene layer in the Contents pane and click Properties. The Layer Properties dialog box appears. A point scene layer without associated feature layer is not supported as input to any geoprocessing tools except Validate Scene Layer Package . A scene layer with associated feature layer can be uses as input to geoprocessing tools that support the same geometry type as the associated feature layer. The analysis operation is executed on the associated feature layer and the result is displayed for the scene layer. The point scene layer can be published as a web scene layer or created as a scene layer package (.slpk) file using the Create Point Scene Layer Package tool and uploaded to ArcGIS Enterprise or ArcGIS Online using the Share Package geoprocessing tool.